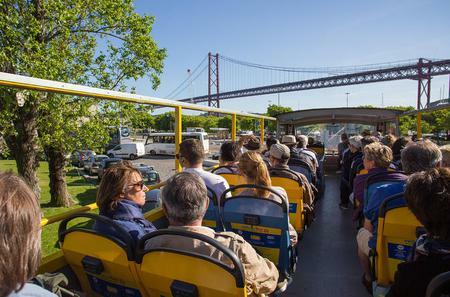 Discover the best of Lisbon on a convenient hop-on hop-off tour. There are several routes to choose from, and you get a quick impression of the entire city, along with the flexibility of selecting the attractions at which you want to spend more time. 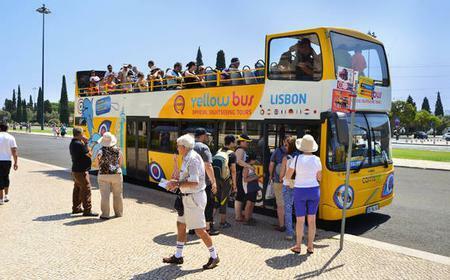 The Yellow Bus Tagus hop on hop off tour plies from the old town centre to Belem, starting from Praca da Figueira, and stopping at ●Rossio, near the Igreja de São Domingos, Santa Justa Lift, and Teatro Nacional D.Maria II, ●Avenida da Liberdade, where you can see the Monumento aos Mortos da Grande Guerra or Monument to the Fallen of the Great War which honors Portuguese WW-I soldiers, ●Marques de Pombal Square, with the bronze statue of the Marquess, ●Praca de Espanha, where you can explore the famous Fundação Calouste Gulbenkian, ●El Corte Ingles shopping centre, ●Parque Eduardo VII, ●Basilica da Estrela, a magnificent Neo-Classical Church that houses the famous terra cotta and cork nativity scene by Joaquim Castro, and then heads to Belem. 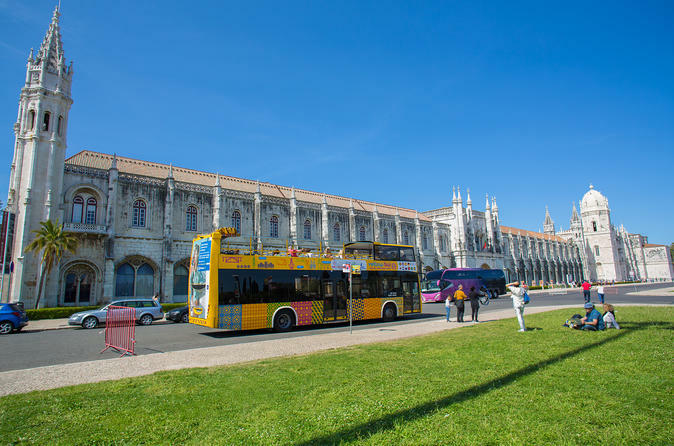 Here, you can see the ●National Coach Museum, which has one of the finest coach collections in the world, ●Jeronimos Monastery, which houses Vasco da Gama’s tomb, ●Torre de Belem (Belem Tower), ●Padrao dos Descobrimentos or Monument to the Discoveries, built to honor Henry the Navigator. 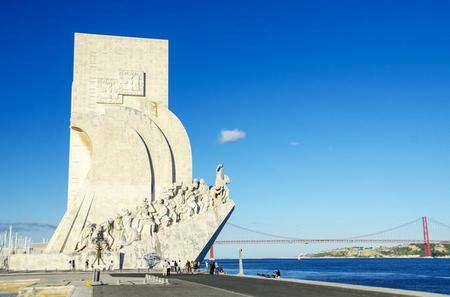 Head back towards the city centre for the ●Museum of the Orient, ●Docas, the nightlife area, ●Museu de Arte Antiga (National Museum of Ancient Art), and ●Cais do Sodre. 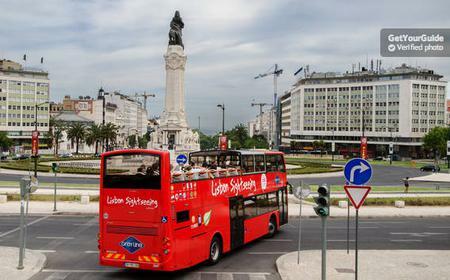 During June – September, buses depart from Praca da Figueira every 15 minutes from 9 am to 8 pm. 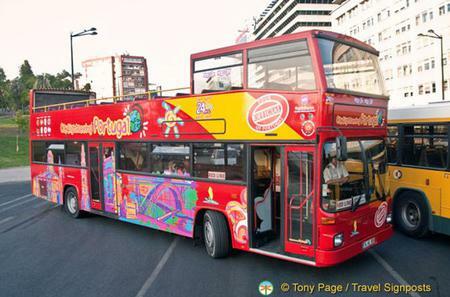 During the remainder of the year, buses depart every 20 minutes from 9 am to 5.30 pm. 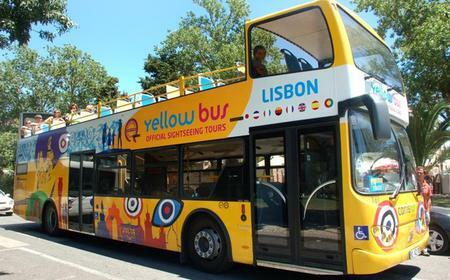 The Yellow Bus Olisipo Tour follows the Tagus to Parque das Nacoes, from Praca da Figueira through ●Casa dos Bicos, ●Fado Museum, ●National Tile Museum, ●Oceanarium, ●Vasco da Gama Shopping Centre, ●Campo Pequeno, ●Marques de Pombal, and ●Cais do Sodre. Buses depart every 30 minutes from 9.15 am, till 7.15 pm in summer and 5.45 pm the rest of the year. 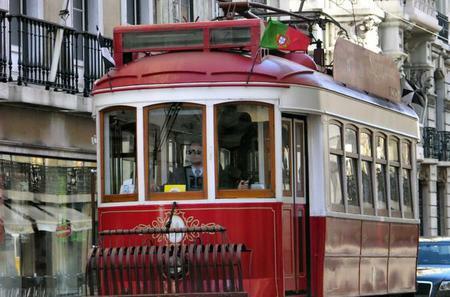 The Castle Line takes you through the oldest quarters of Lisbon such as Alfama and Castelo. 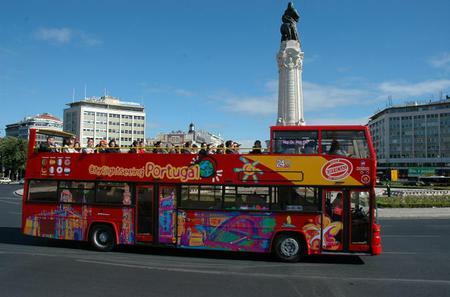 The buses stop at ●Parque Eduardo VII, ●Avenida da Liberdade, ●Rossio, ●Casa dos Bicos, the 16th century home of Alfonso Alburquerque, notable for its façade of Renaissance and Manueline influence, ●Fado Museum, which traces the evolution of Fado music since its origins, ●Lisbon Cathedral, simple and serene, ●Alfama, the quaint quarter with Roman and Moorish influences, ●St. George Castle, which dates back to the 6th century, ●Church of São Vicente of Fora, a majestic but somber 12th century monastery, ●Santo Antonio Church, and ●Design & Fashion Museum. During April – October, buses depart every 30 minutes from 9.30 am to 6 pm. During November – March, buses depart every 30 minutes from 10am to 5 pm. Belém Line buses take you through the city centre and the monumental quarter of Belém, where many of the monuments and museums connected with the Portuguese seafaring past are located, including UNESCO World Heritage Sites Jeronimo’s Monastery and Tower of Belem. 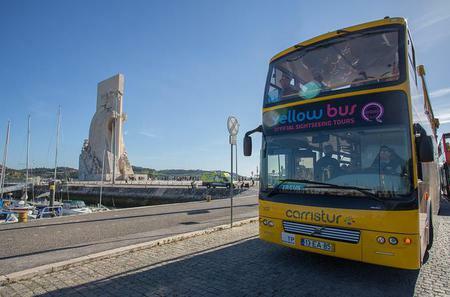 The buses head to Belem, with stops at ●Rossio, ●Cais do Sodré, ●Coach National Museum, ●National Archaeology Museum, ●Museu de Marinha or Maritime Museum, ●Berardo Collection Museum that displays a fine assembly of modern and contemporary art, ●Jerónimos Monastery, ●Belém Tower, ●Monument to the Discoveries, ●Alcântara Docks, ●National Museum of Ancient Arts, ●Museum of the Orient, ●Basílica da Estrela, ●City Museum, ●Electricity Museum in the Tejo Power Centre, ●Santo Antonio Church, ●Casa Fernando Pessoa, where the poet spent the last 15 years of his life, ●Campo Pequeno, where Portuguese bull-fights are held, ●Calouste Gulbenkian Museum, ●El Corte Inglés, ●Parque Eduardo VII, ●Design & Fashion Museum, and ●Puppet Museum. During April – October, buses depart every 25 minutes from 9 am to 7 pm. During November – March, buses depart every 30 minutes from 9:30 am to 5 pm. 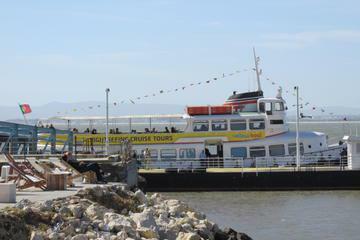 The Oriente Line goes along the Tagus River till Parque das Nações, the modern part of the city with several attractions, such as the Zoo, Casino, Oceanarium, and riverfront promenade. The line goes through ●El Corte Inglés, ●Lisbon Zoo, ●Oceanarium, with the nearby Vasco da Gama Tower shaped like a sail and connected to the Oceanarium by cable, ●Lisbon Casino, ●Vasco da Gama Shopping Centre, ●Madre de Deus Convent with its fantastic collection of azulejos at the Tile Museum, ●Fado Museum, ●Casa dos Bicos, ●Chiado and Bairro Alto, the cultural heart of Lisbon, where you can ascend the Santa Justa Elevator, ●Botanical Garden, ●Mae de Agua Aqueduct and Water Museum, ●Military Museum, which displays a huge range of artillery and aritfacts such as Vasco da Gama’s sword, ●Church of Sao Roque, and ●National Pantheon of Santa Engracia. 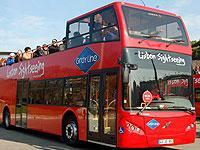 During April – October, buses depart every 45 minutes from 9.15 am to 6 pm. During November – March, buses depart every 60 minutes from 10.15 am to 5.15 pm. The Cascais Line follows the scenic Costa do Sol, running along the sandy beaches, and beautiful coastal towns. Major stops along the route are ●Carcavelos beach, ●Estoril Casino, ●Cascais Bay, ●Guincho, ●Fort of Sao Jorge de Oitavos, ●Boca do Inferno or Hell’s Mouth, a dramatic chasm in the seaside cliffs, ●Casa das Histórias Paula Rego, a pyramid-shaped red building where you can admire some of her works, ●Monument to the Discoveries, ●Jerónimos Monastery, ●Berardo Museum, ●Naval Museum, and ●National Archaeology Museum. 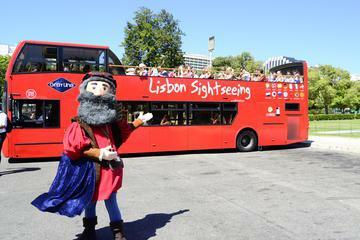 City Sightseeing hop-on hop-off buses start from Marques de Pombal, and take you to the major attractions. 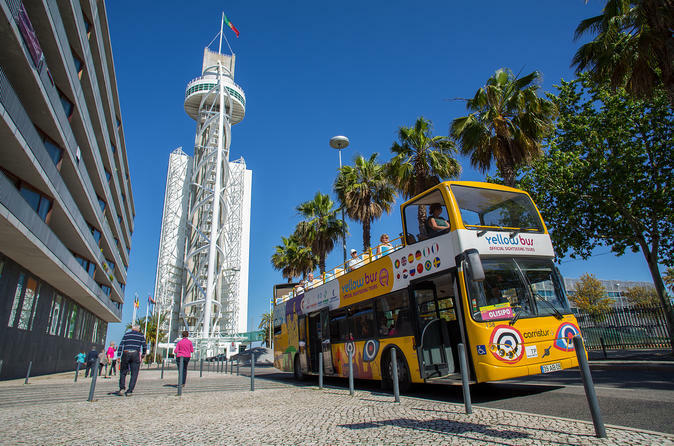 Linha Azul or Blue line buses run northwards, mostly along the shore, stopping at ●Jardim do Principe Real, ●Bairro Alto, ●Chiado, ●Se Catedral, ●Santa Apolonia, ●Mae de Agua Aqueduct and Water Museum, ●Poco do Bispo, ●Museu du Azuleju, ●Ocenario de Lisboa, ●Vasco da Gama Shopping Centre, ●Vasco da Gama Tower, ●Lisbon Zoo, ●El Corte Ingles, ●Parque Eduardo VII, and ●Avenida da Liberdade. During April – October, buses depart every 30 minutes between 9.45 am to 6.45 pm. During the remainder of the year, buses depart every 30 minutes between 9.45 am to 4.45 pm. 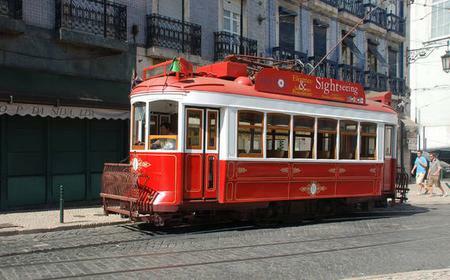 Linha Vermelha or Red line buses traverse the interiors and south coast, stopping at ●Campo Pequeno, ●Calouste Gulbenkian, ●El Corte Ingles, ●Parque Eduardo VII, ●Jardim da Estrela, ●Museum of the Orient, ●Electricity Museum, ●Moument to the Discoveries, ●Belem Tower, ●Centro Cultural de Belem, ●Jeronimos Monastery, ●Belem National Palace, ●Museum of Antique Arts, ●Cais do Sodre, and ●Avenida de Liberdade. During April – October, buses depart every 30 minutes between 9.30 am to 7 pm. During the remainder of the year, buses depart every 30 minutes between 9.30 am to 5 pm. 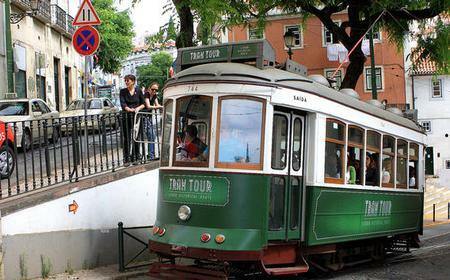 Another way to explore Lisbon is on a flexible hop-on hop-off tram tour, which takes you through the famous quarters in the heart of Lisbon – Baixa, Chiado, and Bairro Alto, and on to Alfama, and Estrela.